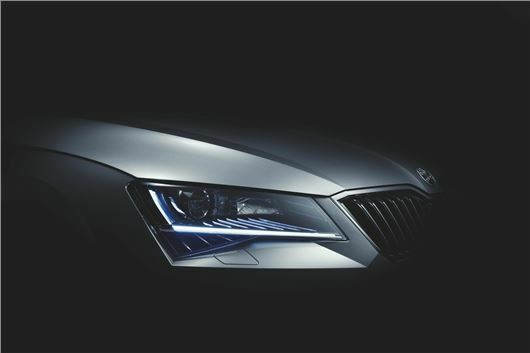 Skoda has previewed the fourth-generation Superb ahead of its global launch at the Geneva Motor Show. The new Superb will go on sale in the summer of 2015, with an expected price increase taking the cost of a base-level petrol S to a shade over £18,000. The teaser picture above is the most that the company will show us of the new car for now, but it suggests a model with significantly more styling brio than before. The current Superb is as critically acclaimed as sub-premium three-box family cars (there’s a category for you) come, and this new version will build on its strengths but add additional flair and quality to the mix. Those strengths are refinement, build quality, no-nonsense cabin layout and, most obviously, space. The Superb offers limo-like rear legroom and an enormous boot, with added practicality by way of a double-hinged hatchback layout. Skoda is suggesting that the quality of the new Superb will be unlike anything Skoda has done before, with the "highest precision and a near-perfect finish, with great attention paid to the smallest detail." It wlll come in hatchback and estate formats, with the latest Euro 6 diesel engines from the Volkswagen Group proving the biggest sellers: the ubiquitous 150PS and 184PS 2.0-litre TDI units will feature heavily. The Group’s 1.4-litre TSI turbo petrol unit with 140PS will be available, as well as the more powerful 2.0-litre TSI with 220PS found in the Skoda Ovtavia vRS. Currently Skoda bolsters the Superb’s executive status with a token 3.6-litre V6 4x4 petrol version, although whether a low volume, big capacity petrol version will stay in the range this time around remains to be seen.